I was prompted by an article by the great Kiwi Co-operator, Ramsey Margolis, on how co-ops can tackle inequality to reflect on the deep connections that exist between ideas of co-operation and of equality. Some might say that the concept of fairness is at odds with the complexity and apparent ungovernable dynamics of modern, open economies – there is little we can do and if there is unfairness, perhaps it will work out in the long run. Co-operatives start from a different understanding and one that increasingly chimes with new research and evidence on human behaviour and social connectedness. We can make a difference. Fairness is about habits, as much as it is about dreams. It is about everyday life, as much as what someone in government (someone else) should do. In rather more dry, theoretical terms, it is about social norms of co-operation and reciprocity. The truth must be that we are all more likely to co-operate if we believe others will behave fairly – and we are more likely to believe others will be fair to us, if we have collaborated with them before. The more we take a long view of time, the more we are able to make a commitment to those around us. Fairness, therefore, is the shadow of the future. 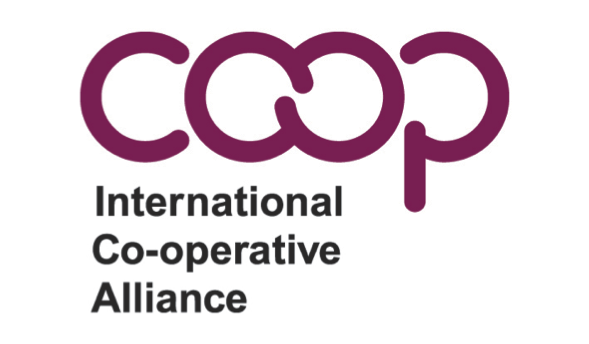 Today is International Coops Day – the 92nd year it has been held and the 20th sponsored by the United Nations (UN) – and the close of the 2014 UK Co-operatives Fortnight. It seems a good day to tell the story of how we developed the Co-operative Marque. Eight months after launching it in South Africa, 740 co-operative businesses have signed up to use the Marque. Those businesses come from 70 countries. Co-operatives have around one billion members worldwide, but most are local or national rather than businesses that operate across borders. 2012, the UN International Year of Co-operatives, gave us a taste for coming together. One of the ideas for follow-up, to give the International Co-operative Alliance more of profile and impact, was to develop an identity mark that was uniquely co-operative. While the image of a rainbow had been the symbol of the Alliance since 1921, it didn’t do what we wanted to achieve, which was to have something to unify the movement, that was business-like, contemporary and able to work across borders. As Chair of the Alliance Communications Committee, a small network of diverse communicators from across the world, the idea came back to me like a boomerang as we were given the mandate to lead this. My hunch was that we wanted something that was not rooted in any one language, but rather a contemporary image that would be drawn from the landscape and heritage of co-operative iconography. So the work started by collecting images of co-ops, as if they were butterflies – or rather bees, birds, sunrise, rainbows, clasped hands, rings, wheat sheaves or pine trees. With online tools, we could then engage people from across the co-operative sector worldwide in ways that would have been inconceivable just a decade before. The agencies developed a survey, translated into different languages and spread through word of mouth through co-operative networks worldwide. The survey explored what stories people told about co-operation, what it meant to them, what they wanted it to mean to others. What emerged ranged from short testimonies through to extended statements and passionate, poetic narratives. The survey then offered a series of images, asking people to select which ones best represented their sense of being connected through co-operation, or that were most associated with the co-operative movement. Over 1,000 people responded, from 86 countries. But what emerged was an insight that turned our first thoughts on their head. The bad news was that co-operation has largely already been co-opted in design terms. While there were many images that people thought were evocative of co-operation, none were exclusively co-operative. In fact, the logos of so many mainstream business are of images that promise mutuality and co-operation, that you might even that they were all actual mutuals. But, hidden in the survey was our answer. We asked the question ‘do you think that we should use ‘coop’ or ‘co-op’ to promote our global identity, even though it is not used or understood everywhere?’. The response to this was an overwhelming yes. The very few ‘noes’ we had were in the English language, either concerned on whether there was a hyphen (a Canadian / UK enthusiasm) or whether it would be confused with an enclosure for chickens. So, while a symbolic image alone wouldn’t be able to express co-operatives in an exclusive way, and while we couldn’t use any other words across the many languages of the world that co-operatives operated in, we could use that one word as a symbol. With that clarity, Penny Stockham and the team at Calverts set about the design of a marque, drawing on some of the classic imagery, from Belgian postage stamps to the clover leaf imagery of UK retail co-ops. The hyphen or not was solved in the design that brought the two symmetrical ‘o’s together. The result was something that we could all see was us – it reflected us, it represented us. Alongside this, we found that colours too vary right across the world, when it comes to co-operation, but also in terms of the widely varied cultural associations with each colour. 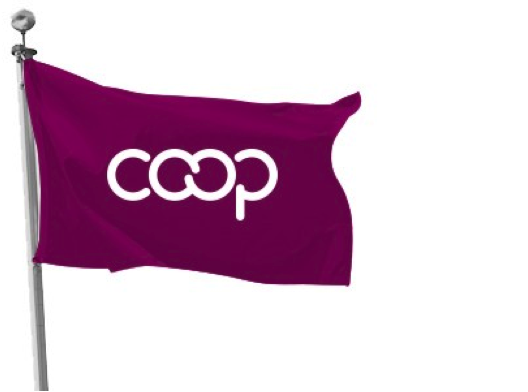 One colour, plum, was chosen as the home colour for the International Co-operative Alliance, which, led then by Nicola Huckerby on communications, changed its own corporate imagery to come into line with the Marque. Six other colours, plus black, made up a palette to offer local choice to fit local needs. Alongside the visual marque, of course, there is also a more longstanding shared identifier, which is the dot coop domain name, established in 2002. The International Co-operative Alliance, following a gift from Midcounties Co-operative in the UK, combined these as a marketing offer. The Co-operative Marque has been used in many different ways, and this can only grow over time. My favourite is these credit cards from a co-operative bank in Brazil. The numbers on the take-up of the Marque are below. It will take time, to build awareness but it can do that in an organic way through the contact and rhythms of co-operatives themselves. The Marque is free to use, with easy to use guidance, but you need to apply to be able to use it – and, naturally enough, it is limited to co-operatives and a few select organisations, such as the UN International Labour Organisation, that are supportive of the sector. If that’s you, please join in. It is a bold but simple idea that we can use the toolkit of marketing to share the difference around the world that we aim to offer as people-centred businesses. A symbol of hope, perhaps. Coops and the World Cup – Viel Erfolg! Succes! Boa Sorte! Buena Suerte! Bonne Chance! The countries left in the World Cup are ones by coincidence all that we have had contact with over recent years, having something special and co-operative going on domestically. 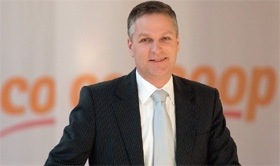 And in that spirit, Fred Bosch, chief executive of Coop Netherlands, has sent us over a note on how he reconciles co-operation with the competitive demands ahead in football and in retail. “This year’s International Day of the Cooperatives coincides with the quarterfinals of the World Cup in Brazil. Coincidental, but meaningful! There are quite some similarities between the World Cup football teams and cooperatives. More specific: between the Dutch football team & Coop Supermarkets in the Netherlands. It goes far beyond the nation’s color that we both share: Orange. As with football, it’s all about collaborating when playing the game the cooperative way. Based on true cooperative principles like fair play, we need to do things together, with a great team spirit. This way, we can score, achieve goals and finally: win! Just like the Dutch Football team in the World Cup, Coop plays on high level within the highly competitive supermarket industry in the Netherlands. And, just like the Orange team, as we call our Dutchies in the World Cup, we have a very clear and sound vision: Together, we would like to be the best! The Coop Orange team says: ‘Let’s go for it!’ We will join forces and offer our customer members an amazing Coop Supermarkt experience. It’s all about great experiences, like our football team showed when impressively beating Spain in their first round opening match in Salvador, Brazil. We are truly proud of our national football team and their dedication in delivering value. And, while we celebrate the Cooperatives’ International Day for which we wish every consumer cooperative all the best, we now also celebrate our support to our nation’s football team in all our stores with special “Orange” offers with great enthusiasm. As for Saturday July 5th, it is time to let the Orange team show what they are really made of! We would like to wish all teams good luck, or, in domestic language of all the quarter finalists: Viel Erfolg! Succes! Boa Sorte! Buena Suerte! Bonne Chance! The social care sector, catering for the most vulnerable people in society, has been hit hard by austerity measures. Social care costs account for one third to one half of local government core budgets and the squeeze on funding has meant that low pay has become endemic to the model of state care, as it has been among private sector contractors. In the home care sector, eight out of ten workers are on zero-hour contracts. The demand for social care, though, is increasing, leading to an interest in hybrid models of mutual care, self payment and state support. Drawing on the work of around seventy mutual pioneers in the social care field, we launched yesterday in Cardiff a new strategy for the sector, which explores the potential for a radical new model of social care, drawing on innovation from Italy. The ‘social cooperative‘ model turns the users of social care into partners, alongside the workforce, with both given an ownership stake in the business and a share in its success. It is an approach of services delivered ‘with and for’ care users and carers. There is now a social co-operative in every town in Italy, with a labour force of 360,000 – greater than the total number employed by private sector residential care providers across the UK. Disability Wales, for example, is developing a model for a co-operative of direct payment users, challenging the idea that services have to be managed either by the individual consumer or by the municipal state. The strategy launched by Co-operatives UK in association with the Wales Co-operative Centre, and written by Pat Conaty, marks I hope a clear statement of intent to develop a new market of quality care – a market which is with and for vulnerable people.